VANCOUVER, July 6, 2018 /CNW/ - Destination Canada has concluded a trade mission lead by the Government of Canada to strengthen relationships with key partners in China during the 2018 Canada-China Year of Tourism. David F. Goldstein, Destination Canada's President and CEO, joined the Honourable Bardish Chagger, Leader of the Government in the House of Commons and Minister of Small Business and Tourism, and other federal, provincial, territorial and private sector partners to key events with partners in Beijing, Hangzhou and Shanghai. Destination Canada signed two Memoranda of Understanding on the mission to enhance marketing efforts in China. A new Memorandum of Understanding with UTour will see the two organizations collaborate in research and development, and marketing. A renewed Memorandum of Understanding with Ctrip will continue to build the strategic partnership to promote Canada's tourism brand in China with an increased focus on Indigenous experiences and Atlantic Canada. "As we celebrate the Canada-China Year of Tourism, this tourism trade mission to China provided a tremendous opportunity to open new markets and to develop and build on existing relationships for our federal, provincial and territorial partners and tourism businesses. By strengthening our business-to-business connections in this key market, we continue to work towards our government's goal of doubling two-way trade by 2025." "The Chinese market continues to grow and we are working with our provincial and territorial partners and tourism businesses from across the country to seize the opportunity. By aligning with partners in China such as Ctrip and UTour, we can showcase uniquely Canadian tourism experiences to prospective Chinese travellers." "Under the promotion of the 2018 Canada-China Tourism Year, the outbound tourism market in China is setting off a new wave of Canadian tourism. 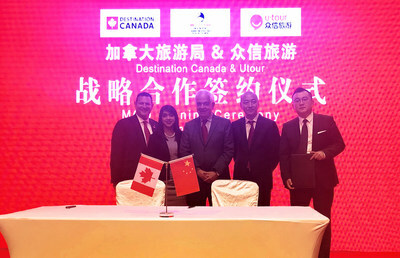 UTour is willing to cooperate with Destination Canada, fully tap the consumer demand of all levels of the market, expand marketing cooperation space, further improve product quality, enrich product categories, provide excellent services for Chinese tourists to keep exploring this wonderful country that is Canada, and jointly contribute to the further development of Sino Canadian relations." 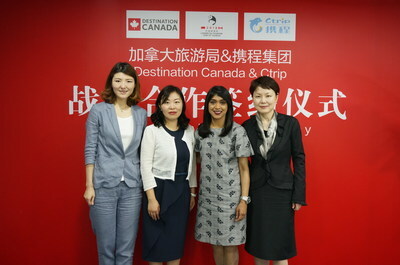 "Since the first partnership agreement between Ctrip and Destination Canada was signed in 2016, we have worked closely for the last three years. By leveraging on Ctrip's big data and one-stop integrative online services platform, the Canadian tourism market has experienced continuous growth. The 2018 Canada-China Year of Tourism is a timely opportunity for Ctrip and Destination Canada to engage further in-depth cooperation." Destination Canada markets Canada internationally as a premier four-season tourism destination. In collaboration with partners in the Canadian tourism industry, Destination Canada creates marketing campaigns designed to showcase the best our country has to offer. Destination Canada also provides research and industry data to our partners—equipping them to optimize their businesses. For more information, please visit: www.destinationcanada.com, sign up for Destination Canada News and follow @DestinationCAN and @ExploreCanada on Twitter.